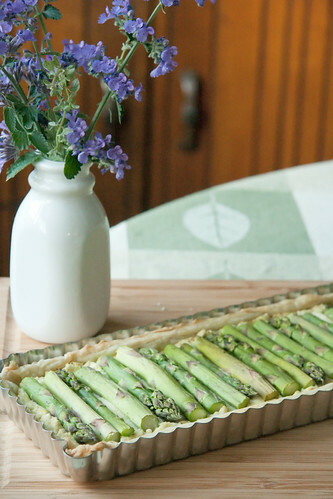 This pretty spring-inspired tart is filled with a lemony ricotta filling and topped with fresh asparagus. Serve with a simple green salad as part of a light brunch, or as the main course for a vegetarian dinner party. On a lightly floured surface, roll out the puff pastry into a 16x7" rectangle. Transfer to a 14x4" rectangular tart pan with a removable bottom, and press the pastry down against the bottom and up against the sides. Run a rolling pin over the top to create a clean edge. (If you don't have a rectangular tart pan, place the rolled-out pastry on a parchment-lined cookie sheet, and fold in the edges to create a 1" wide border). Pierce the bottom and sides of the crust with a fork. Line with parchment paper and fill with pie weights or dried beans. Bake for 10 minutes in preheated oven, then remove the parchment and weights. Continue baking the crust for another 5-7 minutes, or until golden. Gently press down the bottom of the crust if it has puffed up too much, then set aside to cool for 5-10 minutes. Meanwhile, in a mixing bowl, use a fork to mash together the ricotta, romano, lemon zest and thyme until combined. Season with salt and pepper to taste. Add beaten egg and cream, and mix until smooth. Spread evenly into the cooled crust. Cut the asparagus into 3½" lengths. Arrange cross-wise on top of the filling, alternating between spears and stems, until the filling is completely covered. Bake in preheated oven for 15-20 minutes, or until asparagus are tender and filling is lightly browned. Let rest for 5-10 minutes before slicing and serving, or let cool completely to serve at room temperature.